One thing about being a part of Moms of Master Books is that I never really know just what I'll end up with in a given month. Well, I sort of know. I know the titles of the books that are planned for the next few months (actually, only through February at this particular point), but having a title doesn't always prepare me for what I will receive. 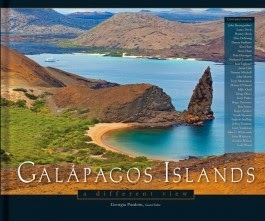 Galapagos Islands: a Different View was not what I anticipated at all. Written by a lot of folks, with Georgia Purdom serving as general editor, this is part science text, part history text, and part biblical account -- all rolled up in a gorgeous coffee-table photography book. The photos are stunning, and every page has them. All one hundred plus of them. This book is worth the $18.99 pricetag even if you only gaze at the photography. You can check out a book sample and see for yourself! The text is great too. I knew almost nothing about the Galapagos Islands except that they have lots of types of finches, as Charles Darwin noted. Now I know so much more about their geography, climate, plants, animals... and even more about those finches and about Darwin too. Every page I read, I found something fascinating. Such as the various currents that impact the islands. The three they focus on are the Cromwell Current, the Humboldt Current, and the Panama Current, though others are illustrated on the map. But then I turn the page and read about the seven distinct ecological zones on the islands and why they exist. This book is gorgeous, fascinating, and wow, am I glad we own it. You have to watch this book trailer, which includes film footage from Dr. Purdom's visit to the Galapagos Islands, but it also shows some of the beautiful pages of the book itself. There is a Book and a Treat Facebook party coming up Tuesday, January 28 at 8 pm Central Time, where you could win cool prizes as shown above -- and discuss the book too.